The following Dodge & Cox Stock fund is one of Kiplinger’s 25 Best Funds and one of the oldest funds. This fund has an investment style of investing in US domestic large blend companies. This type of class should be part of your investment portfolio. The rule of thumb is to have about 20-30% of total investment asset diversified in this fund type. You can also invest in other Kip 25 US domestic stock funds such as BBH Core Select, Fidelity Contrafund, T Rowe Price Equity Income, Primecap Odyssey Growth, and Vanguard Dividend Growth. Dodge & Cox Stock fund objective is to provide long term growth for principal and income. This fund also tries to provide consistent current income as a secondary objective. It prefers to invest in broadly diversified portfolio of common stocks. There are >80% of its total assets invested in common stocks. This Dodge & Cox fund also may purchase other type of securities, such as preferred stocks and convertible bond. The remaining 20% total assets are invested in U.S. dollar-denominated securities of foreign stocks. It will select companies that are not listed in the S&P 500 list and are traded in the United States stock market (NYSE, NASDAQ, AMEX, etc). Capital Gains: If any, are distributed in December and March. Since January 1977, John R. Gunn has managed this DODGX fund. He is the CEO as well as the CIO (Chief Investment Officer) of this fund. If you are interested to invest in this fund, please note that the minimum balance to open a brokerage account is $2,500 and $1,000 for IRA account. The minimum subsequent investment is only $100 for either account. This fund is a no-sales load fund as well as no 12b1 fee. The annual expense ratio is 0.52%, which is quite low compared to the category average of 1.26%. This fund has 3-stars rating from Morningstar. This best fund has been in the market for around 45 years, it gains 35 years with positive return and 10 years with the negative return. Data shown that the best 1-year total returns was achieved in 2003 with 32.34%. The worst 1-year total return in 2008 with -43.31%. 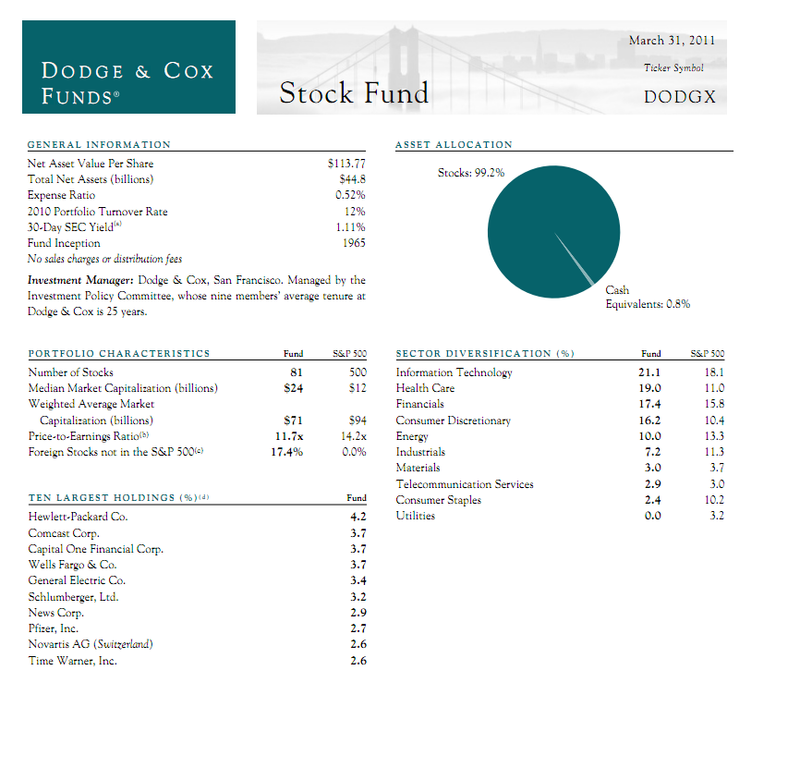 DODGX fund has 9.97% of year-to-date return. The load adjusted returns is 15.60% over the past one year and 5.66% over the past decade. There are 82 brokerages that provide this large value US stock fund, include Vanguard, DATALynx, Merrill Lynch, Schwab Institutional, JP Morgan, Royal Alliance, Raymond James, MSSB Retail Fund, Etrade Financial, T. Rowe Price, CommonWealth PPS, etc. The annual holdings turnover as of May 2011 is 12.00% while the average turnover in the category is 59.28%. As per the first quarter of 2011, the 10 largest holdings of this fund are Hewlett-Packard Co. (4.2%), Comcast Corp (3.7%), Capital One Financial Corp (3.7%), Wellls Fargo & Co. (3.7%), General Electric Co. (3.4%), Schlumberger, Ltd. (3.2%), News Corp. (2.9%), Pfizer, Inc. (2.7%), Novartis AG (2.6%) and Time Warner, Inc. (2.6%). The top 5 sectors of this fund are Information Technology (21.1%), Health Care (19.0%), Financials (17.4%), Consumer Discretionary (16.2%), and Energy (10.0%). Issuer Risk: Any changes in financial condition of issuer may change the issuer’s value. Management Risk: This fund manager may have incorrect opinion about the intrinsic value of invested companies. Equity Risk: As any stocks fund, the fund volatility may be higher than fixed income fund. Market Risk: Depending on general market condition, this fund also subject to decline or advance over short term or long term period. Non-US Issuer Risk: Foreign stock may fluctuate depending on its political economic, currency and market stability.